This Sesame Street bounce rental brings your favorite characters to your next event. Jump with Elmo! Bounce with Big Bird! 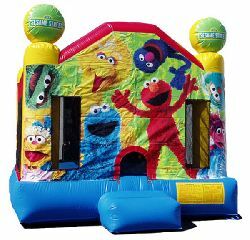 Play with Grover, Zoe, Cookie Monster, Oscar and all your favorites in this Sesame Street bounce house.